The kingdom of Denmark has, despite its relatively small size, often punched above its weight internationally. Vikings raiding from Denmark and the other Nordic nations changed the course of 9th- and 10th-century European history; in the Middle Ages, the Union of Kalmar united all of Scandinavia under Danish leadership. In recent times, Denmark has been known for its modern economy and extensive welfare system, while enjoying an often difficult relationship with the European Union. 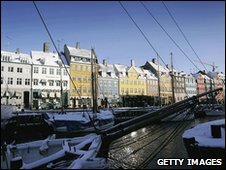 The Danes rejected the euro as the national currency in a referendum in September 2000. Analysts believe that Danish fears of loss of political independence and national sovereignty outweighed any economic arguments about the benefits of joining the eurozone. Denmark's euroscepticism put it at odds with many of its European partners seven years previously when Danish voters rejected the Maastricht Treaty which proposed monetary union and a common European defence force. Denmark had to be granted opt-outs from these provisions before the treaty was approved in 1993. The Social Democrats led a string of coalition governments for most of the second half of the last century in a country generally known for its liberal traditions. Poul Schluter then became the first-ever Danish prime minister representing the Conservative People's Party in 1982, leading a centre-right coalition until 1993, when he was succeeded by the Social Democrat Poul Nyrup Rasmussen. A new centre-right coalition headed by Anders Fogh Rasmussen came to power in November 2001 promising tighter immigration controls. A third successive centre-right Rasmussen, Lars Lokke, took over as prime minister in April 2009. His government, dependent as it is on the right-wing populist People's Party to push through legislation, has witnessed immigration and integration emerge as major issues of public debate. Denmark's progressive tightening of its immigration laws has led to charges that its strict rules violate European norms. The country has won plaudits for its healthy economy. Its employment levels are the envy of many industrialised countries and it accommodates a competitive economic edge as well as a generous social security system. Danish cinema has won international recognition, not least for its willingness to experiment. Through the late 1990s and early 2000s the Dogme movement directors often used hand-held cameras to dynamic effect in a conscious reaction against high-tech, big-budget cinema. Greenland and the Faroe Islands are self-governing territories of Denmark. Helle Thorning-Schmidt became Denmark's first female head of government after her alliance secured a narrow majority in parliament following elections in September 2011. The opposition parties ousted the rightist coalition of Lars Lokke Rasmussen in a closely fought election. Ms Thorning-Schmidt was a member of the European Parliament before taking over as leader of the Social Democrats in 2005. She led them to defeat in the 2007 election, having campaigned to relax immigration rules and oppose tax cuts. Taxation and immigration remain controversial issues among the parties of Ms Thorning-Schmidt's coalition. Born in 1966, Helle Thorning-Schmidt studied political science in Denmark and Belgium before working as a Danish trade union consultant in Brussels. She married Stephen Kinnock, the current head of the World Economic Forum and son of British Labour politicians Neil and Glenys Kinnock, in 1996. They have two daughters. Ms Thorning-Schmidt is known in Denmark for her stylish dress sense, leading some papers to dub her "Gucci Helle". Less helpful was an official investigation into her tax affairs last year, in which she acknowledged having made a mistake in declaring Mr Kinnock a non-resident. The couple were cleared of wrongdoing. Denmark's public broadcaster, Danmarks Radio (DR), operates two TV networks and national and regional radio stations. It is funded by a licence fee. TV2, a government-owned commercial broadcaster, operates regional outlets and an internet-based on-demand service. Private stations are available via satellite and cable. There are some 250 local commercial and community radio stations, as well as national and semi-national commercial networks. Freedom of expression is provided for in law. The principle was cited by the Jyllands-Posten daily amid a backlash by some Muslims in 2006 over its publication of cartoons depicting the Prophet Muhammad. The images sparked violent protests in some countries. There were around 4.8 million internet users by June 2010 (Internetworldstats.com). Is Denmark breaching human rights?